Who is Captain James Fitzmorris, RAF? Captain James Fitsmorris with plane. Golfers at Western Hills Country Club sometimes stumble upon a plaque on the course honoring one Captain James Fitzmorris, RAF, who died when he crashed his Sopwith Camel aeroplane on takeoff from the Club. Plaque at the Western Hills Country Club that reads "In memory of Capt. James Fitzmorris M.C. R.A.F. A gallant soldier devoted to duty. Born April 1st, 1897 Sterlingshire, Scotland. Died here, August 14th, 1918. August 14 marks the 100th anniversary of the crash that sent shockwaves all over Europe and the U.S. 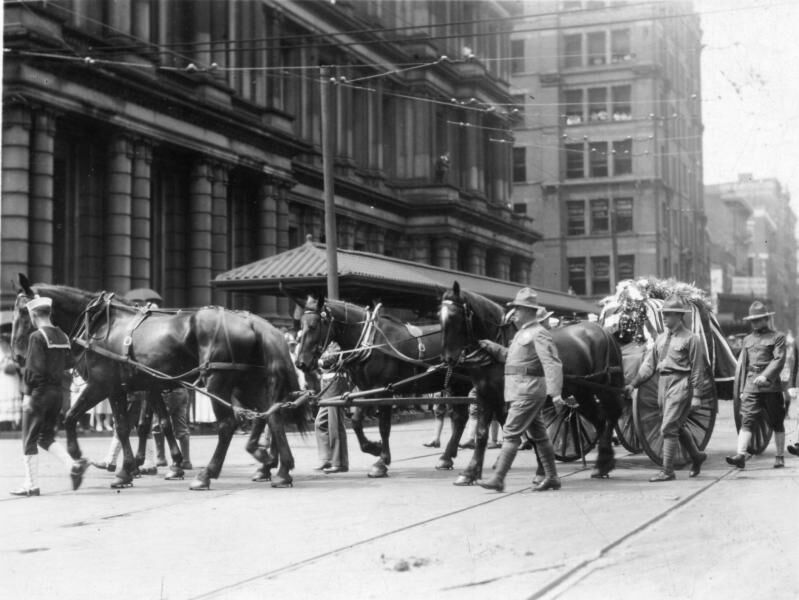 Hundreds of thousands lined the Cincinnati streets a few days later as his funeral procession passed. And thousands more attended his funeral in Scotland when his body was returned to his home in 1919. But now he is mostly forgotten. Who was this Captain Fitzmorris, and what was he doing at Western Hills Country Club? Fitzmorris was a World War I flying ace, having scored 14 victories (German planes taken down) between 1914 and 1917, for which he was awarded the Military Cross. Wounded twice, he finally was sent to the U.S. in 1918 to serve as a flight instructor for the newly formed U.S. Army Air Service (now the Air Force). 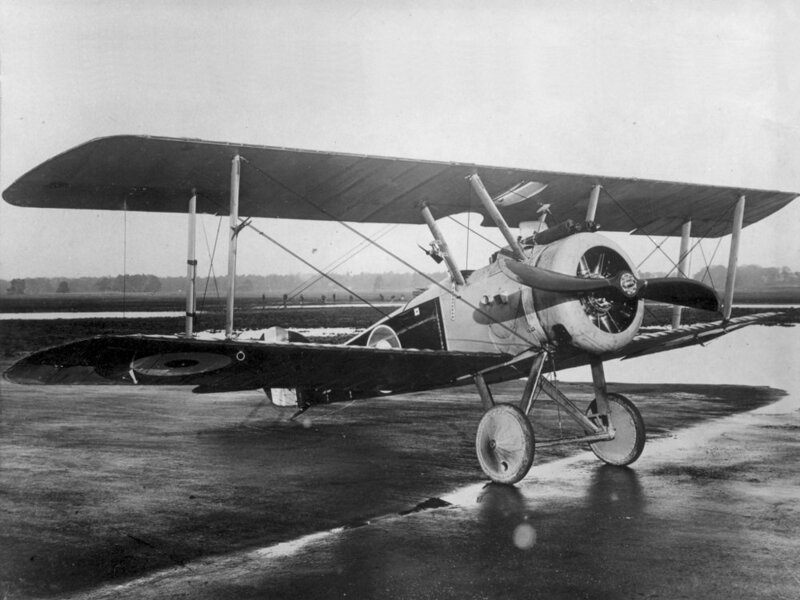 Example of a Sopwith Camel. During the summer of 1918, a group of pilots toured the Midwest to raise funds in support of the war effort. Capt. Fitzmorris was flying a Sopwith Camel - Snoopy's plane. There weren't many airports back then, so they landed overnight at the country club. While taking off on the morning of August 14, Fitzmorris's plane stalled and nosedived back onto the course and rolled on top of him on impact. Reports say he was not feeling well and might have passed out. He was 21 years old. Capt. James Fitmorris' death certificate. Because of the fear of German U-Boats, the military determined not to send his body back to Scotland. The city decided to give him a full military funeral befitting a war hero and on August 17, the funeral cortège left Memorial Hall in Over-the-Rhine - out Spring Grove Avenue to his resting place. 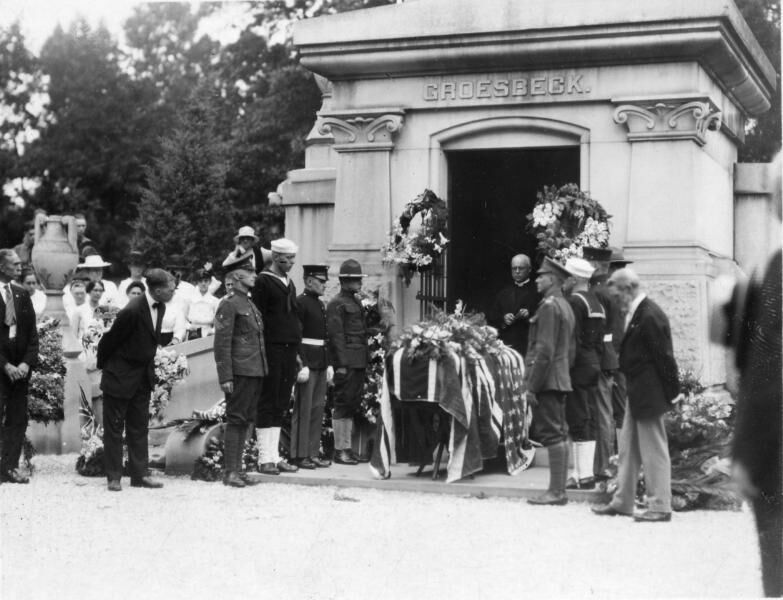 The Groesbeck family offered their mausoleum in Spring Grove to hold his body until after the war. The Groesbeck family mausoleum in Spring Grove. His funeral was attended by 4,000 mourners, with approximately 250,000 more lining the route of the procession according to newspaper reports. A year later, after the war was over, his remains were repatriated and re-interred at Old Churchyard in his hometown of Polmont, Scotland. "In loving and affectionate remembrance of Major James F.Morris M.C. R.F.C. Eldest son of James and Jeanie Morris Rosehall Polmont who was killed at Cincinnati U.S.A. while on a special mission on 14th of August 1918 aged 21 years."